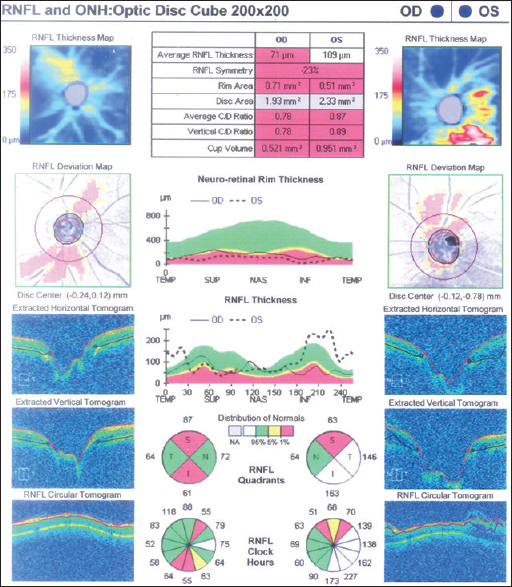 Herein, we report a case of acquired optic nerve pit in a 46-year-old Indian male, a known case of primary angle closure glaucoma (PACG) compatible with treatment for the past 15 years. He presented to our clinic with complaints of recent decrease in vision; on examination, his visual acuity was found correctable to 6/6 and 6/12 in the right and left eye, respectively. Fundoscopy revealed glaucomatous cupping in both the eyes and subretinal fluid in macula of the left eye. Swept-source optical coherence tomography macula and retinal nerve fiber layer disclosed acquired pit of the optic nerve (APON) in the left eye. The patient was under continuous follow-up and maculopathy spontaneously resolved. An APON may indicate progression of glaucoma and was more commonly reported in cases of primary open-angle glaucoma; we aimed to report an unusual presence of APON in a case of PACG. Dr. Weithe first described the clinical presentation of two optic disc depressions in a 62-year-old woman in 1882, which later has been addressed as optic disc pit (ODP). We present this case for the rare nature of the disease, so ophthalmologists can be vigilant as its appearance may indicate progression of glaucoma and comes with complications such as serous maculopathy which presents as schisis-like cavities in the outer retina. A 46-year-old Indian male with known case of primary angle closure glaucoma (PACG) for the past 15 years was on the treatment with bimatoprost and beta-blocker combination in both eyes post-YAG peripheral iridotomy (PI). The patient had complaints of recent onset of decreased vision in the left eye; his visual acuity was correctable to 6/6 and 6/12 in the right and left eye, respectively; pupils were equally round and reactive. No relative afferent pupillary defect was observed. Intra-ocular pressure using Goldmann applanation tonometry was 14 mmHg in both eyes. Anterior segment revealed patent YAG PI and there were no other remarkable changes on fundus examination. Glaucomatous cupping of 0.8 was noted in both eyes and subretinal fluid in the left macula [Figure 1]a. Visual field showed paracentral arcuate scotoma [Figure 1]b. To unearth the cause of sub-retinal fluid (SRF) and decreased vision in the left eye, swept-source optical coherence tomography (OCT) macula and retinal nerve fiber layer (RNFL) were done, and to our surprise, it was acquired optic nerve pit. Subsequently, expert opinion from retina consultants was sought for further management of maculopathy [Figure 2] and [Figure 3]. 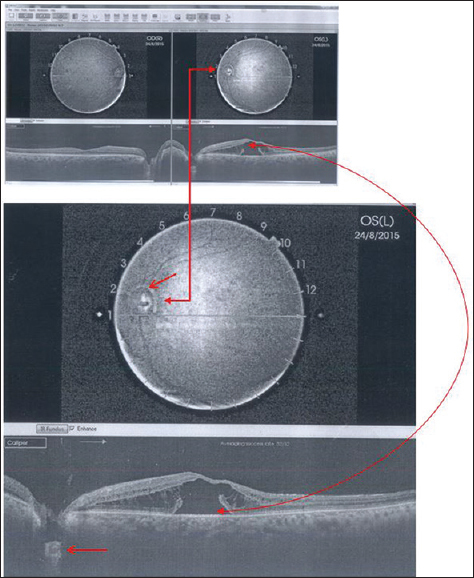 The patient was asked to discontinue bimatoprost and to continue timolol for the left eye and was advised for continuous follow-up for 3 months; on review of 3 months, visual acuity was correctable to 6/6 N6 in both eyes, and there was spontaneously resolving maculopathy of the left eye, optic nerve pit remain unchanged [Figure 4]. As the possibility of recurrent maculopathy and serous retinal detachment secondary ODP remains, the patient was asked for continuous follow-up and to report immediately if any visual changes. An acquired pit of the optic nerve (APON) also appears to be a distinct pattern of optic nerve damage that can be used as a reliable sign of glaucoma. Our case is also consistent that ANOP appears to be more prevalent in low-tension glaucoma. In our case, there was spontaneous resolving of maculopathy and the optic nerve pit remains unchanged. 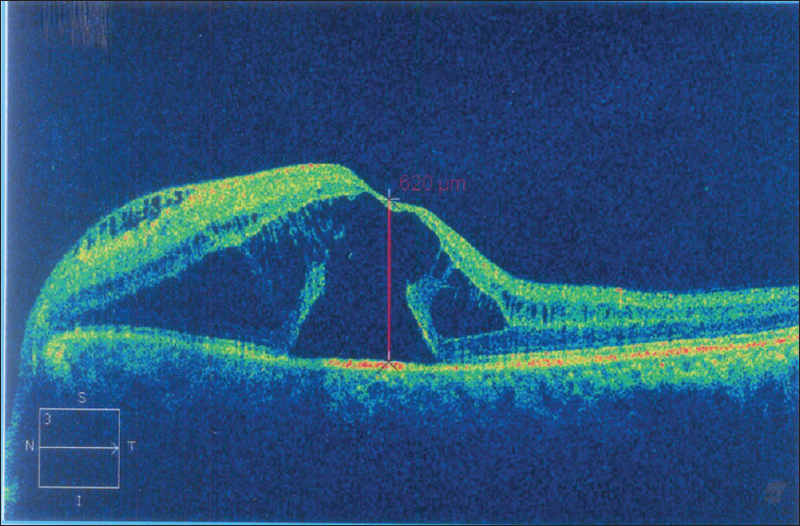 Among patients with glaucoma, patients with APON represent a subgroup who are at increased risk for progressive optic disk damage and visual field loss, so careful stereoscopic observation may lead to the diagnosis; however, additional testing such as OCT imaging is helpful in appreciating the depth of pitting and the potential conduit to the subsensory retinal space. This is an unusual presentation of acquired optic nerve pit in PACG. To the best of our knowledge, such a case has not been reported previously in literature. Lincoff H, Lopez R, Kreissig I, Yannuzzi L, Cox M, Burton T, et al. Retinoschisis associated with optic nerve pits. Arch Ophthalmol 1988;106:61-7. Ugurlu S, Weitzman M, Nduaguba C, Caprioli J. Acquired pit of the optic nerve: A risk factor for progression of glaucoma. Am J Ophthalmol 1998;125:457-64. Javitt JC, Spaeth GL, Katz LJ, Poryzees E, Addiego R. Acquired pits of the optic nerve. Increased prevalence in patients with low-tension glaucoma. Ophthalmology 1990;97:1038-43. Quigley HA, Hohman RM, Addicks EM, Massof RW, Green WR. Morphologic changes in the lamina cribrosa correlated with neural loss in open-angle glaucoma. Am J Ophthalmol 1983;95:673-91. Smith JL. The optic nerve workup. Trans Sect Ophthalmol Am Acad Ophthalmol Otolaryngol 1977;83:778-85. Hirakata A, Okada AA, Hida T. Long-term results of vitrectomy without laser treatment for macular detachment associated with an optic disc pit. Ophthalmology 2005;112:1430-5. Avci R, Yilmaz S, Inan UU, Kaderli B, Kurt M, Yalcinbayir O, et al. Long-term outcomes of pars plana vitrectomy without internal limiting membrane peeling for optic disc pit maculopathy. Eye (Lond) 2013;27:1359-67. Kranenburg EW. Crater-like holes in the optic disc and central serous retinopathy. Arch Ophthalmol 1960;64:912-24. Sugar HS. An explanation for the acquired macular pathology associated with congenital pits of the optic disc. Am J Ophthalmol 1964;57:833-5. Sugar HS. Congenital pits in the optic disc and their equivalents (congenital colobomas and coloboma-like excavations) associated with submacular fluid. Am J Ophthalmol 1967;63:298-307. Petersen HP. Pits or crater-like holes in the optic disc. Acta Ophthalmol (Copenh) 1958;36:435-43. Bonnet M. Serous macular detachment associated with optic nerve pits. Graefes Arch Clin Exp Ophthalmol 1991;229:526-32. Yuen CH, Kaye SB. Spontaneous resolution of serous maculopathy associated with optic disc pit in a child: A case report. J AAPOS 2002;6:330-1.